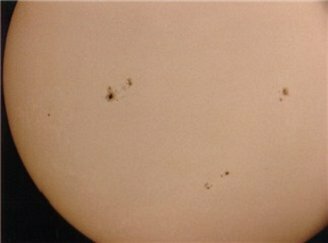 Sunspots are areas of lower temperature but high activity on the sun. These are caused by the looping and shearing of the magnetic field lines due to the sun's differential rotational speeds (i.e. : equator rotates faster than poles). 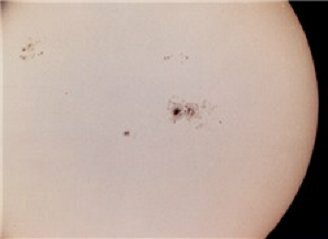 Many times, flares and prominences (loop-like structures) are associated with these sunspots. 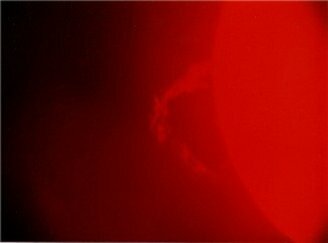 Solar Flares are a tremendous explosive burst of light and material from the sun. A flare gives off as much energy as the earth consumes in 100,000 years. This energy can affect the Ionosphere, changing the height of the D, E and F layers and affects communications, etc. 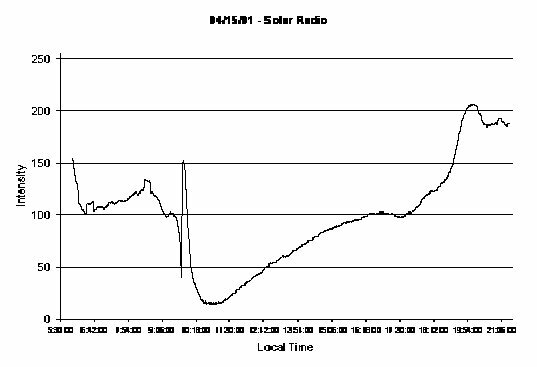 The flare-induced changes in the Ionosphere can be detected using various radio frequencies. The AAVSO has chosen to use VLF. I use the 24.0 KHz signal from Cutler, Maine. Far Circuits sells a circuit board for this project for about $7 (details on the site). It makes it a lot easier to build the project. Most parts are available from Radio Shack or Mouser Electronics. I used a ten-turn potentiometer for the tuning so I can get better control. The antenna is easy to make but consists of 125-200 turns of wire! 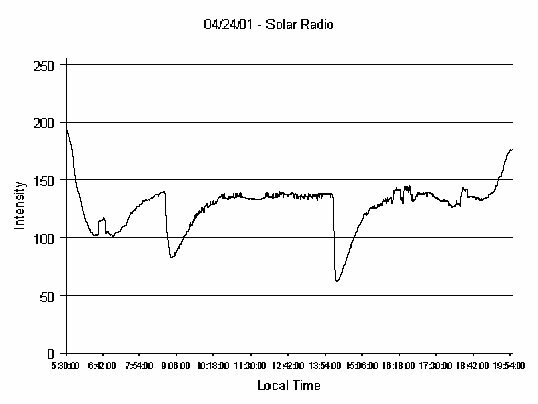 Detected flares are generally caused by X-ray flares and have various flux levels associated with them (see chart below). 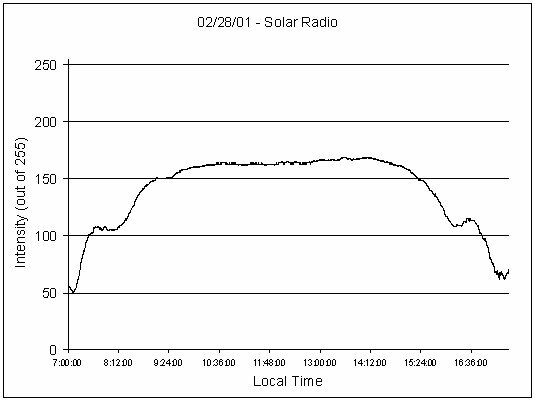 The radio detection records a peak (or a trough as in my case) when a flare is detected (see graphs below). To join the AAVSO Solar Radio group simply register on-line. You are given a number and a program to use to facilitate sending the data the group leader and the data is made into a monthly chart. Please feel free to contact me for more information, questions, or comments. Integrated flux from start to end, in joules m E-2. A quiet day with no flares present. Note the peaks on both ends - called the sunrise effect. A day with an amazing X 14.4 flare! SARA members who wish their projects linked from this page should email the webmaster, indicating the URL and project details.